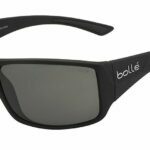 This entry was posted in Hiking Accessories Recommended Products and tagged backpacking gear bolle hiking gear julbo mountaineering gear native eyewear oakley smith on January 21, 2019 by Laura P.
Sunglasses are often perceived as more of a fashion accessory, but wearing sunglasses on a regular basis is actually crucial for the health of your eyes – not least if you spend a lot of time outside, whether hiking, mountaineering or climbing. Most of us know the feeling of tired and overly sensitive eyes after having spent a long time in the sun without sunglasses and your eyes are indeed harmed by overexposure to ultraviolet radiation. Talking long-term, UV-rays are a contributing factor in the development of eye issues like cataracts (leading to blindness), macular degeneration and eye-surface problems like pterygia and pingueculae. As the potency of the UV rays from the sun increases with altitude (4% for every 305 meters/1000 feet), hikers and mountaineers are more at risk than other people when they spend hours at high altitudes. Another factor can be the reflection of sunrays from landscapes more or less covered with snow, ice or water. Remember that UV light is also present on grey and cloudy days since at least 40-50% of the sunrays penetrate through the cloud cover, which means that your eyes can easily get tired and irritated in not so sunny weather. Besides UV light, sunglasses can also protect your eyes from strong winds which can dry out and irritate your eyes. 1. 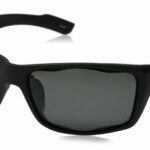 Buying Hiking Sunglasses – What is important? The shape of a pair of sunglasses might seem insignificant compared to the quality of the lenses etc., but it is crucial that your sunglasses are shaped to let in as little sunrays to the eye area as possible. The worst possible shape in this regard might be John Lennon’s iconic teashades which permit sunrays to enter from every angle except immediately in front of the eye. A much better option is to choose a model with wide rims and a frame that has a U-like shape rather than rectangular angles, so that it wraps around your face rather than protruding from it. If your sunglasses do not wrap all around to your temples, it is very important that the sidepieces are wide enough to block out most of the sun rays coming from the side. For this list we have only selected sunglasses which have a U-shaped frame and/or wide sidepieces. As you probably remember from physics in primary school, there are different types of light rays such as ultraviolet, infrared etc. The most important feature of the lenses in a pair of sunglasses is that they block out 99% or 100% of the ultraviolet (UV) light. Some manufacturers (especially European) write “UV400” or “UV absorption up to 400nm” – this means that they block out 100% of the UV rays. Another way to distinguish between levels of protection is the so-called Visible Light Transmission (VLT) categories 0-4. Sunglasses in categories 0-1 are for fashion use rather than sun protection as they allow more than 50% of the visible light to enter your eye while category 2 sunglasses are the most common type which can be used for all general purposes. However, when it comes to hiking and mountaineering in open mountain ranges as well as water sports we would recommend category 3 sunglasses which allow less than 20% of the visible light to come through to your eyes. Category 4 sunglasses are only meant for activities in the brightest conditions imaginable, such as glacier walking or high altitude hiking as they block out more than 90% of the visible light. This also makes them unsuitable for driving (unlike category 2-3 sunglasses). 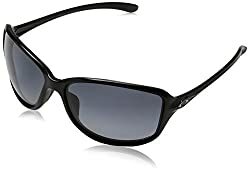 All sunglasses on this list are available with category 3 lenses, but some also have category 2 and 4 lenses as options – or even photochromic lenses which themselves adjust the amount of incoming of visible light depending on the light conditions (thus being able to change between more VLT categories). 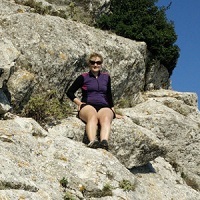 Polarized lenses, which some of the sunglasses on this list have, are indeed helpful in reducing glare from shimmering surfaces such as water, snow and wet surfaces, but as polarization has nothing to do with UV-protection it is not a requirement for sunglasses used for hiking, climbing and mountaineering. The color of the lenses is also not an indicator of the level of UV protection a pair of sunglasses can offer; rather, the tint of the lenses affects how you see your surroundings. Grey lenses give the most natural rendering of the colors around you while brownish lenses increase contrast – it is up to you what you prefer for hiking. Plenty of cheap sunglasses have lenses which block out 100% of all UV light and thus it is a fallacy that you have to buy expensive sunglasses to get adequate protection. However, more expensive sunglasses are usually made of better and more durable materials, which mean that they do not break as easily as cheap sunglasses. This is obviously an advantage for hikers and mountaineers. For this list we have chosen only top-quality sunglasses with fair prices and steered clear of overpriced designer sunglasses, where you pay for the name tag (and the marketing machinery behind it) rather than the quality of the materials used. Sunglasses are meant to be used, so be sure to choose a pair that fits your style so you will use them day in and day out. For this list we made an effort to find topnotch hiking sunglasses which will also appear stylish in everyday-life rather than looking overly sporty. 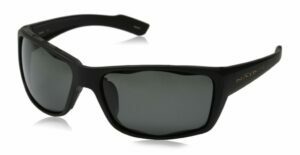 Those of you who are looking for sunglasses with a more sporty design might be happy to know that we are planning to include such on an upcoming list of the best hiking sunglasses for men. Eye size (width of lenses) 2.3 in. 2.6 in. 2.4 in. 2.5 in. 2.6 in. Bridge size (width between the lenses) 0.63 in. 0.63 in. 0.55 in. 0.63 in. 0.71 in. Temple size (arm piece length) 5.3 in. 4.9 in. 5.1 in. 5.1 in. 5.2 in. We already mentioned the Julbo Monterosa sunglasses in our list of the best gifts for female hikers and they surely also deserve a place on this list – not least due to their versatility. 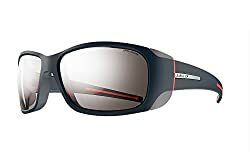 Julbo Monterosa are primarily designed as glacier glasses with wide side pieces, protecting your eyes from nearly all angles of light, but the unique side shields can also be removed as wished and thus the Monterosa easily converts into a pair of more casual-looking sunglasses. The Julbo Monterosa comes in various color combinations, which are paired with one or more particular sets of lenses. The lenses available for the Julbo sunglasses include the category 3 Spectron3CF lenses, the category 4 Spectron4 lenses and the brand’s Reactiv Photochromic lenses which can adjust themselves to let in more or less visible light (changing within category 2 to 4) depending on the light conditions. The Reactiv Photochromic lenses can either be the Cameleon version which is optimal for extreme visual conditions such as in the desert, high mountains and on the sea, or the Zebra version which is more all-around and adjust itself faster to varying light conditions. 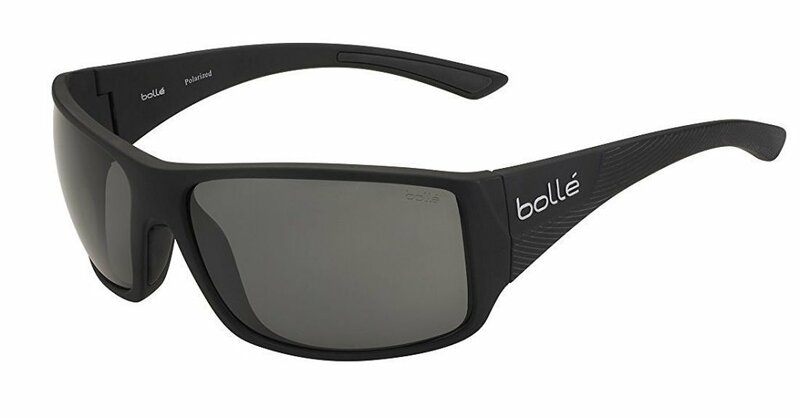 French Bollé started making sunglasses and ski goggles in the late 1950’s and is still one of the most high-esteemed manufacturers of premium eyewear for all sorts of outdoor activities. The Bollé Tigersnake is a great option for hikers and mountaineers as its wide rims and sidepieces will for sure protect your eyes against sunrays coming from any imaginable angle. It is available in a handful of stylish colors. The lenses differ slightly depending on the color of the frame they sit in, but they are all category 3 which means that you can safely use them for driving as well as be completely protected against damaging sunrays as all Bollé lenses offer 100% UV protection. The most popular model (color: Shiny Black) has two options for lenses; either the grey TNS lenses which have a Carbo Glass coating for optimal scratch-resistance or the slightly more expensive polarized TNS Oleo AF lenses which besides the polarization have been given an anti-fog treatment and a oleophobic/hydrophobic treatment, so you won’t have to deal with nuisances such dirt, grease and waterspots. 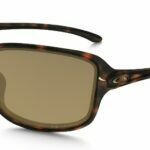 The Oakley Cohort sunglasses surprise by combining a ladylike design with great functionality for hiking and other outdoor activities. While the sidepieces are quite slim, the wraparound shape of the frame nonetheless ensures that you are protected from sunrays coming from the sides. 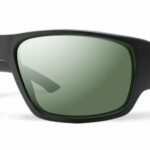 The Oakley Cohort sunglasses come in five colors – each with their own kind of lenses, although all offer 100% UV protection. Two of the five models (Metallic Black and Polished Black) have grey category 3 lenses which permit only 18% of visible light to enter your eye; the lenses in the Polished Black are also polarized which make them slightly pricier. The remaining three models (Amethyst, Sepia and Tortoise) have brownish lenses which permit between 22% and 24% of the visible light which technically make them category 2 lenses. Since these numbers are so near the arbitrary limit of 20% between the two categories, also these three Oakley Cohort models should be suitable for hiking nonetheless. Three of the models only have category 2 lenses. Smith has a wide range of beautifully designed sunglasses, but for this list we choose to include the Dragstrip model. Dragstrip is otherwise categorized by Smith as men’s sunglasses, but in today’s world such categories are arbitrary at best. Dragstrip only come in two different colors of frames (Matte Black and Matte Tortoise), but with eight different colors and types of lenses you should be able to find a combination which suits exactly your taste and needs when outdoors. All lenses provide 100% UV protection and the majority of them are category 3 in terms of the visible light they let through to the eye. The exceptions are the Blackout lenses in ditto frames which are on the limit to category 4 as they only let 10% of visible light pass through (and thus might require some caution when driving) and the Brown lenses found in the Matte Tortoise frames which might not be suitable for hiking at very high altitude since they let in 25% of all visible light. The other six kinds of lenses are polarized and have different tints. Hikers who indulge in nature sights might be especially enthralled by the lenses with Smith’s ChromaPop™ technology as they provide more clarity and greater color definition. Denver-based Native Eyewear is not as widely known as the other brands on this list, but nonetheless produce some really high-quality sunglasses – one of the most popular being the Wazee model. There are six different colors of frames and four types of lenses, but common for the latter is that they are all made of impact-resistant poly crystal carbonate (P.C.C) and polarized to reduce glare. You will find grey lenses, which give the most accurate rendition of colors, in the Matte Black and Cobalt Frost sunglasses while the Tortoise and two-coloured Stout Fade sunglasses have brown lenses which provide your surroundings with more contrast. The styles Shiny Black and Moss have mirrored lenses (in blue and bronze respectively) which reduce glare and the transmission of visible light further. However, as the lenses are interchangeable you can combine your Wazee frames with other colors of lenses if you should wish to.